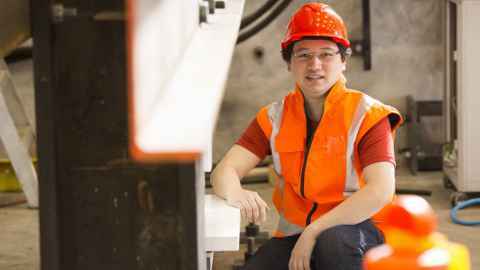 Gary Djojo is studying towards a PhD in Civil Engineering focusing on steel structures. Recent damaging earthquakes in New Zealand have confirmed the importance of earthquake engineering. Lessons from these seismic events have led to improvements to earthquake design standards, assessment methods for older vulnerable structures, and pioneering implementation of seismic resilient earthquake solutions. This state-of-the-art knowledge is now taught within the Master of Earthquake Engineering at the University of Auckland. Earthquake engineers design new buildings and infrastructure to withstand disasters, and assess the vulnerability of existing structures, drawing from expertise in structural and geotechnical engineering. Informed by the latest research and learnings from recent disasters, the Master of Earthquake Engineering provides advanced training to equip Civil Engineering graduates and practitioners with the knowledge and skills required to take on demanding construction or retrofit projects. The University of Auckland is internationally recognised for our strengths in these fields, putting us in the right position to deliver specialist professional capabilities to both New Zealand and internationally. Beyond training a new generation of leading professionals, the Master of Earthquake Engineering aims to support current practitioners in the building industries – those who require skills to navigate increasingly complex building codes, policies and requirements in line with innovations in research and industry.